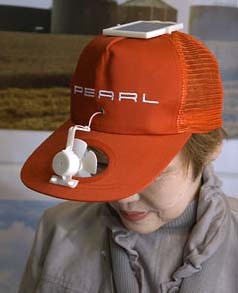 The Japan Organization for the Promotion of Renewable Energy has created this cool cap to keep you cool this summer. There’s a solar panel on top of the cap and it’s attached to a fan thatâ€™s been stuck in a hole on the front. The sunnier it is, the more the fan will cool you down. Some time ago I had something like this, but without solar panel, just batteries, and after a short period of time this thing broke.Wasted money. Saw them in Israel, want to give them as gifts in the US, where can I buy five of them?